Women "... cannot make a good book of Cookery." Johnson actually said that to a woman!! (she compared him to Hercules with a spinner's distaff) In addition to discussing Mrs. Glasse's Art of Cookery, which he had "looked into," he proclaimed: "I could write a better book of cookery than has ever yet been written..."
Following an short excerpt of the 1778 dinner conversation from Boswell's Life of Samuel Johnson, I've written a sentence or two about each of the five persons involved. 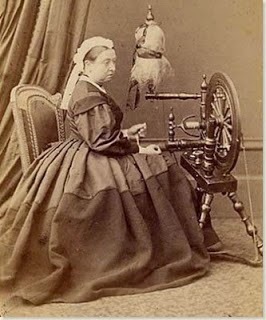 And, perhaps of more interest, why a strong chap like Hercules was spinning with a distaff...and a photo of Queen Victoria 'using' one. "The subject of cookery having been very naturally introduced at a table [at bookseller Charles Dilly's London home in 1778] where Johnson, who boasted of the niceness of his palate, owned that “he always found a good dinner," he said "I could write a better book of cookery than has ever yet been written; it should be a book upon philosophical principles. Pharmacy is now made much more simple. Cookery may be made so too. A prescription which is now compounded of five ingredients, had formerly fifty in it. So in cookery, if the nature of the ingredients be well known, much fewer will do. Then, as you cannot make bad meat good, I would tell what is the best butcher's meat, the best beef, the best pieces; how to choose young fowls; the proper seasons of different vegetables; and then how to roast and boil and compound." Dilly. "Mrs. Glasse's 'Cookery,' which is the best, was written by Dr. Hill. Half the [publishing] trade know this." Johnson. "Well, Sir. This shews how much better the subject of cookery may be treated by a philosopher. I doubt if the book be written by Dr. Hill; for, in Mrs. Glasse's ‘ Cookery,' which I have looked into, salt-petre and sal-prunella are spoken of as different substances, whereas sal-prunella is only salt-petre burnt on charcoal; and Hill could not be ignorant of this. However, as the greatest part of such a book is made by transcription, this mistake may have been carelessly adopted. But you shall see what a Book of Cookery I shall make: I shall agree with Mr. Dilly for the copy-right." Miss Seward. “ That would be Hercules with the distaff indeed." Johnson. "No, Madam. Women can spin very well; but they cannot make a good book of Cookery." Or one can spin off a stick/staff - the distaff - by using a drop spindle. Lots of photos on this Pinterest site: Distaff and distaves for spinning yarn. That is the type Hercules is portrayed using in art - as punishment for killing his friend he became a queen's slave for three years and spun with her ladies. So "Hercules with the distaff" meant a man doing something in the women's realm. Which I think was a smart retort by Miss Seward. Johnson, ofcourse, said "no" - he would not be doing women's work - and brought up the spinning definition. 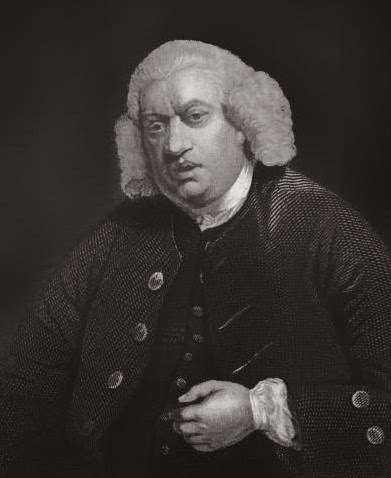 Samuel Johnson (1709-1784) born in Lichfield (as were Anna Seward and Dr. Erasmus Darwin), wrote many works, most notably A Dictionary of the English Language in 1755, and was granted an honorary doctorate. Actually he was more of an editor, taking definitions/quotes from other books - which he did acknowledge. Hannah Allgood Glasse (1708-1770) wrote three books: The Art of Cookery, made Plain and Easy; Which far exceeds any Thing of the Kind ever yet published, 1747, The Servants Directory, 1757 and The Compleat Confectioner, 1760. She used many recipes from earlier authors, many were women - which she did not acknowledge, though some she changed slightly. Dr. John Hill (1714-1775) a doctor and botanist was the author of many books. Anna Seward (1742-1809) wrote poems, knew Sir Water Scott, Dr. Johnson, Dr. Darwin, and wrote on the death of Major Andre and Captain Cook. 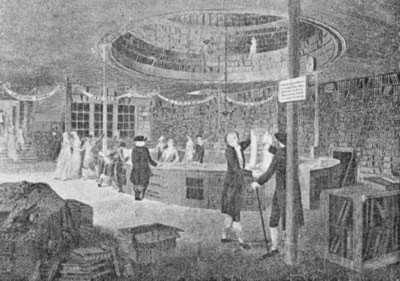 Charles Dilly (1739-1807) joined his brother Edward’s bookseller business which was a “kind of Coffee house for authors” (Benjamin Rush) and they held dinner parties in their home, according to the Oxford DNB. Picture of a fancy, social book store - 'Interior of Lackington's Shop' in The Book-Hunter in London, 1895.